Why We Need a Carbon Tax VI. Because of China! The reality of global warming can hardly be questioned. For example, the extent of summer ice in the arctic ocean is shrinking rapidly. Expecting the Environmental Protection Agency to be able to administer an effective program by giving each state a target for CO2 emissions reductions is cumbersome and arbitrary. The current EPA program of trying to reduce carbon emissions by 30% over the next 15 years will set up an economic incentive to substitute natural gas for coal and slow down the further development of nuclear energy and renewable energy sources such as wind and solar power. This is because natural gas is plentiful and inexpensive. But the burning of natural gas still releases half as much CO2 as coal and so will continue to contribute to global warming. 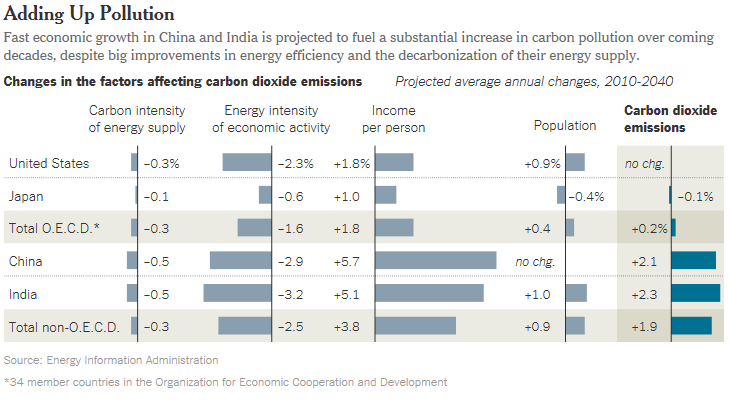 In yesterday’s New York Times, the reporter Eduardo Porter in “China’s Hurdle to Fast Action on Carbon” calculates that even under conservative growth assumptions, China will almost double its carbon emissions between now and 2040. And this doesn’t even consider all of the other developing nations which also will increase their use of inexpensive energy sources in order to increase their standards of living. In other words, even if the EPA is able to force a big switch from coal to natural gas in the U.S., any such reduction in carbon emissions will be dwarfed by increases from other countries. A carbon tax on CO2 emissions will not only give a big boost to all non-fossil fuels, it will also unleash American ingenuity to figure out how to accomplish carbon sequestration in the use of fossil fuels. This will enable the U.S. to achieve a much greater reduction than 30% in carbon emissions over the next 15 years and beyond. Furthermore the new technology which we develop to do this will be immediately available for use around the world. With such a program the U.S. would actually be demonstrating how to effectively attack global warming instead of just advocating for it! This entry was posted in carbon tax, Eduardo Porter, global warming, New York Times and tagged Carbon tax, Global warming, jack heidel, New York Times by jackheidel. Bookmark the permalink. Let me get this straight…we need to tax US citizens and businesses, which takes money out of the economy while China continues to pollute. They use their money to grow the economy and we pull ours out and give it to whom? Don’t you see how this puts us at a disadvantage? If China would add a carbon tax to their citizens and businesses, it make sense. Otherwise, why would we penalize our country. One more thing: when we tax ourselves and say we want it for a project, it usually disappears and is unaccountable. Thank you. I’m starting from the premise that global warming is a very serious problem which the world must address without delay (If you disagree with this, then we have a parting of the ways). Furthermore it is our responsibility as the major world power to lead the way. What is the best way for us to initiate action? Government EPA action is totally arbitrary and, in addition, won’t have any measurable effect on reducing CO2 in the atmosphere. A carbon tax, on the other hand, will create a huge economic incentive for refineries and utilities, for example, to figure out how to prevent the releasing of carbon (carbon sequestration) into the atmosphere while burning and processing fossil fuels. Once carbon sequestration technology is figured out, it can also be used by other countries to control carbon emissions. Then we will have a true solution to this existential threat to the human race.